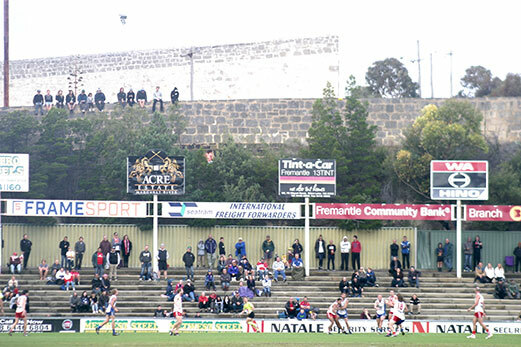 THERE was controversy to open round 12 when Leederville Oval was deemed unfit for play on Saturday and game between Subiaco and Peel was rescheduled to Sunday at Subiaco Oval. The game turned out to be a classic with Peel scoring an unlikely victory. The Lions always looked the more classy outfit against a determined Thunder but just couldn’t put the game away. Peel stayed in touch largely due to ruckman Zac Clarke and hard working midfielders Matt De Boer, Tendai Mzungu and Brad Walsh. However the player of the game was Blair Bell, who was good in the midfield, but won the game with a typically strong contested mark late in the last quarter and kicked the winning goal, his third for the afternoon. Defenders Josh Bootsma and Tanner Smith also carried out crucial roles. Captain Kyal Horsley was remarkable for Subiaco and deserved better. Defenders Declan Jackson and Aaron Heal made it hard for Peel, Dylan Clarke kicked three goals and Hayden Yarran always looked dangerous and kicked two thumping long set shot goals. 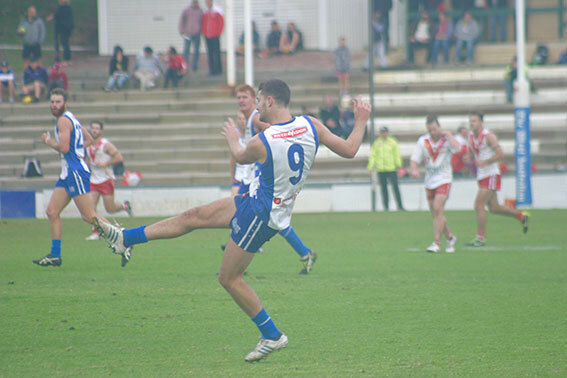 There was a big crowd at Fremantle Oval for the derby despite the wet weather and after a tight start East Fremantle ran away with eight goals to two in the second half to record a comfortable victory against the top team. 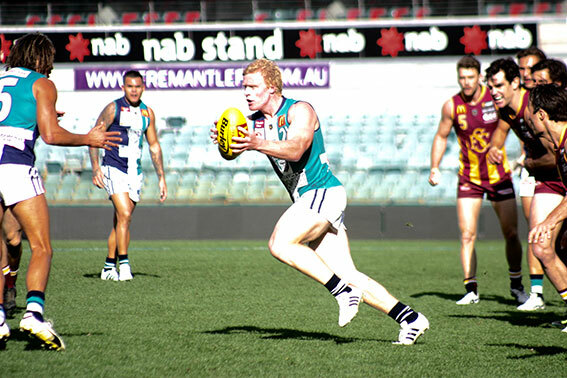 Jack Perham had a break-through game for the Sharks kicking three goals and setting up others. Defenders Dylan Winton, Ryan Lester-Smith, Andrew Stephen, Josh Cuneo and Matthew Jupp were superb, Jesse Crichton hardly touched the ball but also kept Ashton Hams away from it, Brett Peake kicked three goals and James Bristow was strong in the ruck. Tim Kelly worked hard for South Fremantle but missed two vital shots for the goal in the thrid quarter, Thomas Vandeleur and Adam McIntosh were reliable in the back line and Ryan Cook put in another strong performance. The last 13 derbies have now been won by the away team. In the Perth derby at Joondalup West Perth controlled events all day and delivered a crushing blow to East Perth’s finals prospects. Tyler Keitel was superb against his old team, Michael Lourey kicked four goals, Shane Nelson controlled the midfield and Seva Mozhaez held his own in the ruck. Tom Barrass was again outstanding in defence for the Royals. The results this week couldn’t have fallen any worse for the Royals who find themselves three games away from fifth spot. At Bassendean it was tight in the first half but Perth kicked 5.9 to 1.1 to notch a comfortable victory. Michael Sinclair was the best of the Demons, Liam McKenna and Clint Jones were good in the midfield, Taran Etto was solid and Sam Garstone was a good forward target and kicked two goals. Brandon Erceg made an impressive debut for Swans and Matt Riggio was effective again. 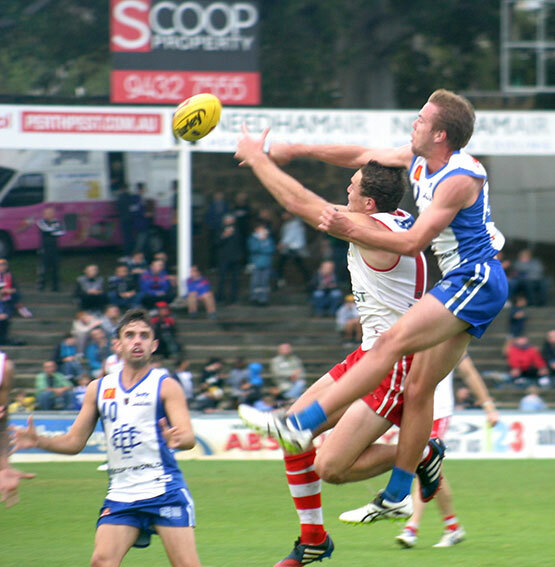 The ladder: South Fremantle 32; Subiaco 32; East Fremantle 28; Peel 28; West Perth 28; East Perth 16; Claremont 12; Perth 12; Swan Districts 4. Next week: WA vs Tasmania at Bassendean Oval, 2.15pm Saturday 11 June. Free entry. The Avenging Eagle (an Erceg) and I went to Bassendean yesterday to watch Brandon’s league debut. Having all the Erceg’s there doubled the attendance. Brandon was terrific with his hardness at the ball and his good hands and disposal. Has had a long journey after several years out of the game, then working his way back through country leagues and the Reserves. The long apprenticeship has really helped with his footy smarts. Unfortunately the same could not be said for his team mates. Tallan Ames is a marvel with the his commitment at over 250 games but a lot of the others are undersized and skinny for WAFL. Dunno where Swans go from here, unless they have money to recruit in the off season. Listening to the coach’s address out on the ground was interesting. More fkcs than Langtrees when the US Navy is in port. Didn’t help them run out the game. Lots of heads dropped in the last quarter.